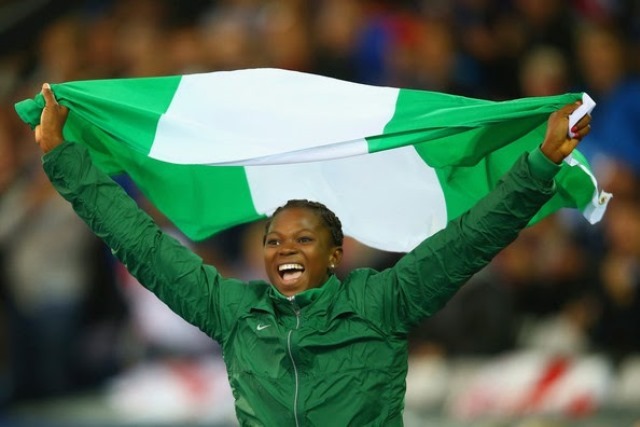 Commonwealth gold medalist Ese Brume lost her national title to Chinazom Amadi as a new women’s 100m champion emerged on Day One of the All-Nigeria Athletics Championships in Warri on Thursday. In absence of Blessing Okagbare-Ighoteguonor, Gloria Asumnu recorded her best time this year to emerge champion in the short sprint ahead of the likes of Stephanie Kalu, Deborah Odeyemi, Nkem Ezealah, Ngozi Onwumere, and Dominique Duncan. Asumnu, who also recorded victory at the same event at the Warri Relays last week, blasted to an 11.42secs finish time. The U.S.-based athletes’ time at the National Trials is- though short of securing for her a spot at next month’s IAAF World Championships in Beijing- but sufficient to see her past Kalu (11.47sec) and Odeyemi (11.66sec), who finished second and third respectively. But triple jumper and 2014 Commonwealth Games silver medalist, Tosin Oke, was, in his own case, able to secure his slot at the World Championships after retaining his national title at the Warri City stadium. Oke improved to a season’s best time of 16.98m to beat Olamide Olamigoke, who took Silver with 16.80m. Ese Brume Celebrates Winning Gold in Long Jump at the Glasgow Commonwealth Games. Image: Getty. Amadi, who finished second behind Brume in the women’s Long Jump event at the 2014 African Championship, claimed her first national crown after clearing over 6.24 distance. Brume came second with a jump of 6.14m and Ruth Usoro, 17, won bronze with 6.07m. Tyrone Akins retained his 110m Hurdle national title and Lindsey Wenyime won the women’s event in that category. Akins powered down the line returning a 13.68secs time, as Alex Al-Ameen (14.00s) and Martins Ogierakhi (14.13s) trailed in second and third positions respectively. Wenyime clocked a 13.40secs time ahead of Oluwatobi Amusan (13.57secs) and Grace Ayemoba (13.68secs). The men’s Javelin was won by Friday Osayande with a throw of 68.33m. Kure Samuel, could not replicate his impressive form in the AFN Golden League, eventually finishing runners-up behind Friday with his best effort recorded at 66.32m. Kenechukwu Ezeofor won bronze with a 65.36m throw. Adeyemi Kazeem claimed the men’s 20km race crown while Faustina Ogu claimed the women’s title. Abike Egbeniyi continued her breakthrough form of 2015 with another victory in the women’s 800m in 2:07.50, as Abiye David claimed silver with 2:09.10 and Sirika Nwoke placed third in 2:10.35. Claire Uke Claimed the women’s Discus with her 50.91m effort as Precious Ogunleye finished runner-up with 48.32m and Celestina Efobi took home bronze medal with 40.59m. The finals of the men’s 100m, 400m and Long Jump are expected to serve as the highlights of the final day of the National Trials, as well and the women’s 200m, 400m and 400m Hurdles.